This summer, guest preachers from St. John’s and the wider community will be preaching on “Stories of Renewal.” We’ve also invited them to share their reflections on our blog in advance of their sermons. This post is by the Rev. Neil Elliott, who will be preaching this Sunday, June 10. Parishioners, be aware, you’re likely to hear a lot about ISAIAH over the summer. 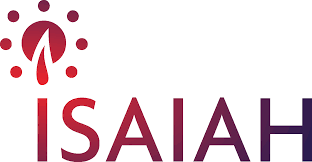 Susan Moss, Craig Lemming, and I have been attending the ISAIAH clergy caucus; Jay Johnson has gathered a committee exploring ways we can get involved as a parish, especially around defending the rights of immigrants; and two of our preachers this summer are organizers with ISAIAH. What, you ask, is ISAIAH? It is a faith-based coalition committed to local change. For almost twenty-five years, congregations around Minnesota—churches, synagogues, and as of today, more than forty mosques—have worked together to take public action in the cause of justice for our neighbors. You can learn more about ISAIAH at their website: isaiahmn.org . In a recent ISAIAH clergy meeting, we heard that people of faith are shy about the language of “taking power” in the public square. That didn’t sound quite right to me. For some churches, taking public action is a matter of survival. If that’s not our story, perhaps we already enjoy enough privilege that we don’t need to take public action. But privilege is another kind of power. The question isn’t whether we have power: It’s whether we use our power to maintain our own comfort, or to stand in solidarity with those in need around us.